Note: Passenger & package freight. Hannah, Lay & Co., Traverse City, MI. 30 x 30", 350hp @ 96rpm engine by Ottawa Iron Works, Ferrysburg, MI. 7' 10/12" x 161" firebox boiler by Johnston Bros., Ferrysburg, MI. 1879, Jun 13 Enrolled Grand Haven; owned Hannah, Lay & Co., Traverse City; operated Traverse City - St. Ignace. 1890, Oct 22 Ran aground on Waugoshance reef, damaging stern post & shoe. 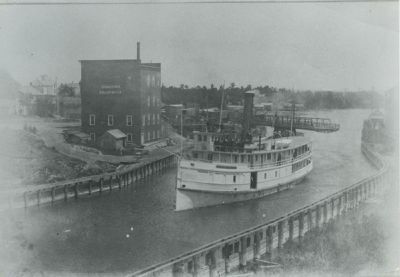 1893, May 31 Owned Oscar E. Wilbur, Charlevoix; same route. 1895, Dec 11 Owned Jay Hursley, Sault Ste Marie; Sault Ste Marie - Marquette. 1897, Apr 28 Ran ashore on Mackinac Island. 1897, May 5 Released by wrecker FAVORITE; to Manitowoc for repairs. 1897, Jun 1 Owned South Haven & Chicago Transportation Co., enrolled Chicago; ran St. Joseph - Chicago. 1899, Aug Leaking enroute to Milwaukee, 200 passengers; reached South Haven safely. 1900, Mar 28 Owned Barry Bros. Transportation Co., Chicago; Chicago - Waukegon. 1901 Recaulked topside, bottom & decks. 1903, Jul 9 Owned Daniel F. Toomey, Dunkirk, NY. 1904 Engine replaced, 30 x 30" low pressure; 10 x 7 3/4' firebox boiler, by Great Lakes Engineering Works, Detroit. 1905, Apr 7 Owned Cleveland, Rondeau & Pt. Stanley Navigation Co.
1907, May 25 Owned Wm. G. Fitzgerald, Detroit. 1907, Sep 7 Sold Canadian; owned Gillies & Rutherford, Tobermory, ONT. Purchase reproduction Comment on this item Create electronic postcard Charlevoix, MI. Charlevoix, MI. detail South Haven, MI. c1898 c1905. c1905. c1907. Charlevoix, MI.